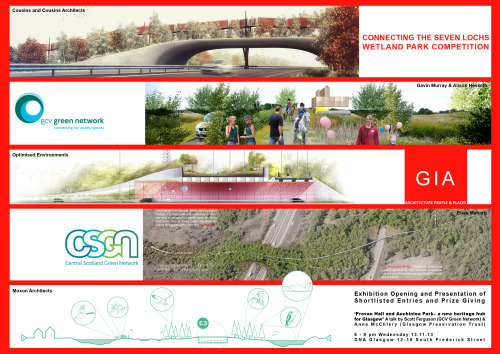 Following on from our feasibility study for the 7 Lochs Wetland Park, GCVGNP, CSGN and The Glasgow Institute of Architects launched a competition to design a ‘Green Bridge’ linking the park. 18 entries were submitted, and 5 teams have been shortlisted. The judges, including Collective’s Lizzie Smith who was a lead consultant on the feasibility study, were very impressed by the quality of submissions. A presentation from the 5 shortlisted teams and an exhibition of all entries will take place on Wednesday 13th November at 6pm, at DNA Glasgow 12-16 South Frederick St.